Anomalys is first single from the debut album “THE GUILT”. Written by The Guilt. Recorded by Alain Steffler and The Guilt, mixed and mastered by Alain Steffler. Anomalys is a song about peeling off layers. It’s about being and wanting everything, even the weirdnesses and the ugliness. Craving life to it’s full extent, without censoring. In the western “free world”, you can be and do whatever you want, as long as it fits the box, as long as you have enough power, prestige and profit. If you don’t, you’re a sickness, a deviation, an anomaly. That’s the long explanation. The short one is- life is a mess so find someone to hold hands with. And “Anomalys” is the name of a cool punkgarage band from Holland. 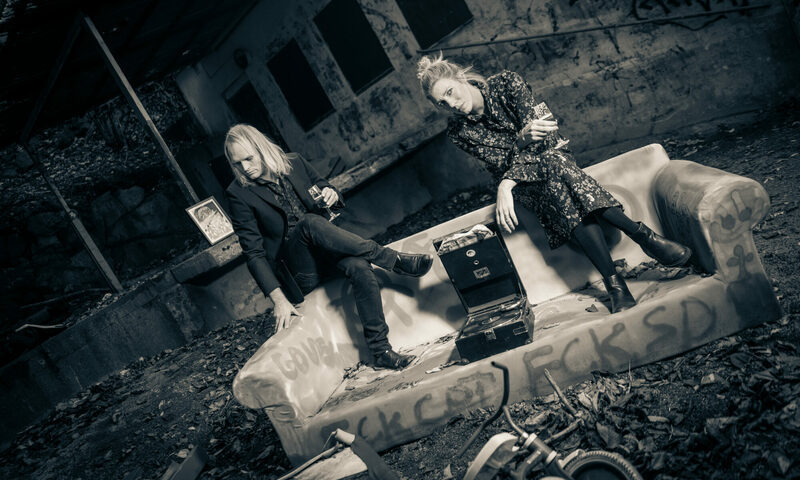 This explosive duo from Malmö, Sweden, is the death in disco and the dance in revolution. With their lazerpunk agenda they are pushing the boundaries of punkrock one high-kick at the time. On the 5th of May 2017 The Guilt are releasing their debutalbum “The Guilt” on Heptown records. The release will be followed by touring across Europe in May and June 2017. The Guilt is a quirky concept of dancy tunes and punk aggression all combined in a sweaty live show. It’s heavy vocals, simple beats, busted guitar hammering and most of all something that happens on stage. So how do you translate bad jokes and aggressive dancing into an album? For making sense of this, Emma and Tobias chose Gustav Brunn(Atlas losing grip, Lawgiver) and Alain Steffler(Le Prince Harry, Experimental Tropic Blues Band), as their primary third parties. They’ve been someone to argue with but also they’ve been the fresh ears on songs written between 2012-2016. The album was mostly recorded in The Guilt’s own quarters with additional recordings and mixing by Gustav, Alain and also Joakim Lindberg (MFMB). The album was mastered by Alain Steffler.